I am a freelance writer, author of 5 books, grant-writer, poet, river rat, amateur astronomer, and nonprofit consultant from Texas. We built one of these bad boys at summer camp the first year I taught canoeing. For a final exam I took the kids on a river trip—an innovation that worried my camp director. Fortunately, this was back in those halcyon days before lawyers made it impossible to do anything fun. The director green-lighted the project on the grounds that it was fun and cheap and made the campers happy. All it cost was a little gasoline and that was going for about 30 cents a gallon in the mid 70's. We did need one thing, though—a canoe trailer. We had an old boat trailer or two sitting around, so we pulled parts from both, cleaned off the pads and winch post, picked the best two tires and the tail lights that were in the best condition and used the one trailer license tag that we had between them. We figured this design out as we went and it worked great. Another camp attempted the same thing, but put the paddle locker standing up between the uprights. 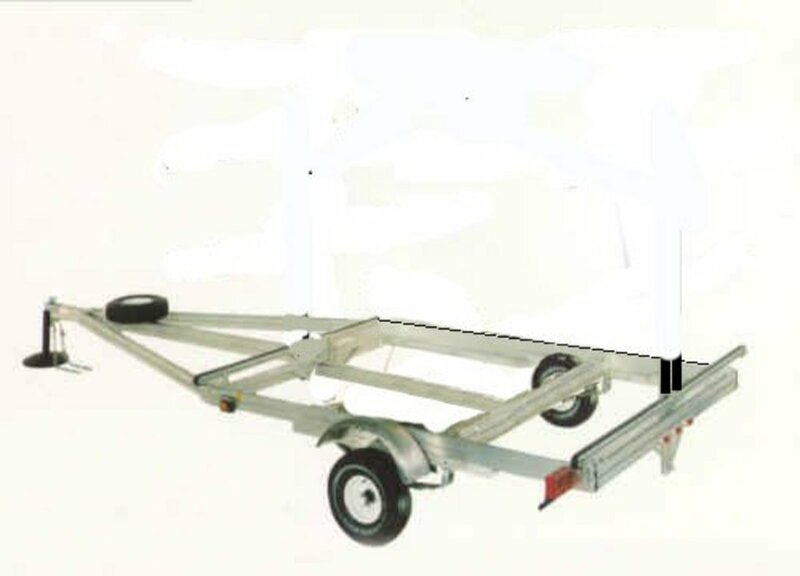 On a windy road, a cross breeze caught the trailer and the extra lateral wind resistance that high tipped the trailer on its side scattering canoes up and down the side of the road. This design keeps weight low as possible and creates a sturdy support for the boats. You can add a couple more feet and an extra pair of cross members to make it an 8 boat canoe, but I wouldn't want to try it unless a lot of your boats were kayaks. A top-heavy canoe trailer can be all sorts of awkward to drive. Strip the winch and hull rollers and pads off the old trailer. Step 1: Strip the rollers, boat pads, winches, etc. off the trailer frame, overhaul the brake lights, backup lights and turn signals, and make sure the tires are roadworthy. Step 2: Weld two uprights in front and back of the trailer frame as shown above. They should be 6 to 8 feet tall and made of 2x2 tube steel. Weld the 3 cross members into place on the front upright. Step 3: Weld the cross members (cross-trees) in place on the front upright. These can be 1x2 tube steel or 1x2 angle iron. The tube steel looks better, but is more expensive. Weld the bottom ones four to six inches above the bed depending on how deep you plan to make the equipment locker. 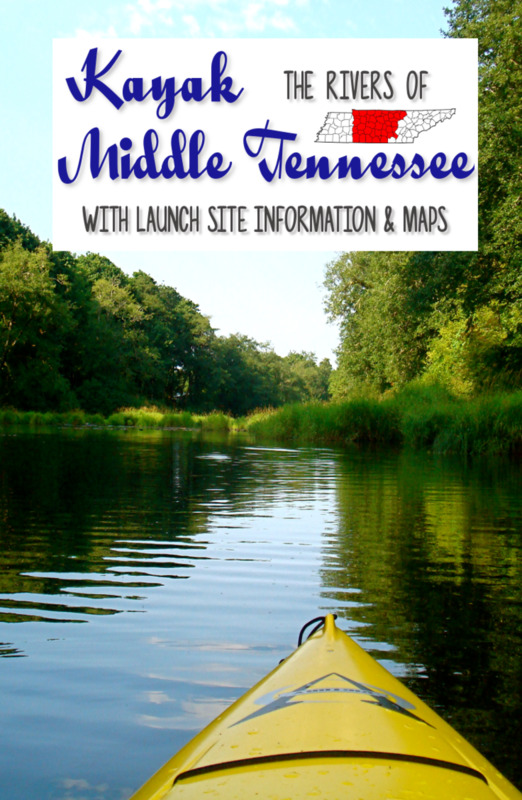 Space them two feet or better apart depending on the keel height of your canoe. Weld the 3 cross members into place on the rear upright. Step 4: Weld the cross members to the rear upright as above. Step 5: Weld a ridge pole made of 1x2 tube steel running lengthwise along the trailer between the tops of the uprights. Weld triangular gusset plates to stiffen the cross members. 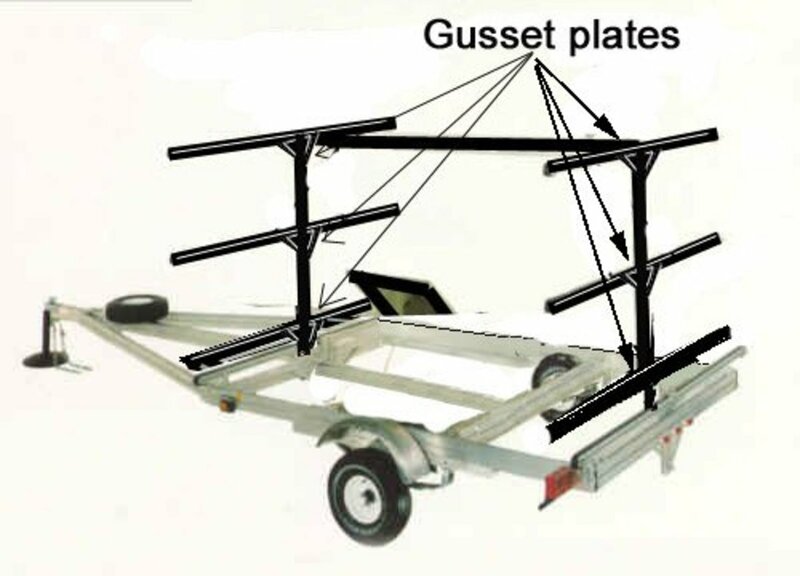 Step 6: Cut 6-inch triangular gusset plates of 1/4 or 1/8 inch steel plate and clamp them point down in place under the cross-trees and against the uprights as shown in the diagram. This strengthens the cross-trees so they don't sag under the weight of the boats. Step 7: Weld the gussets into place. Run a weld bead along the top of the gusset underneath the cross members as shown in the diagram. Next run a bead along either side of the upright to attach the gusset to the upright. 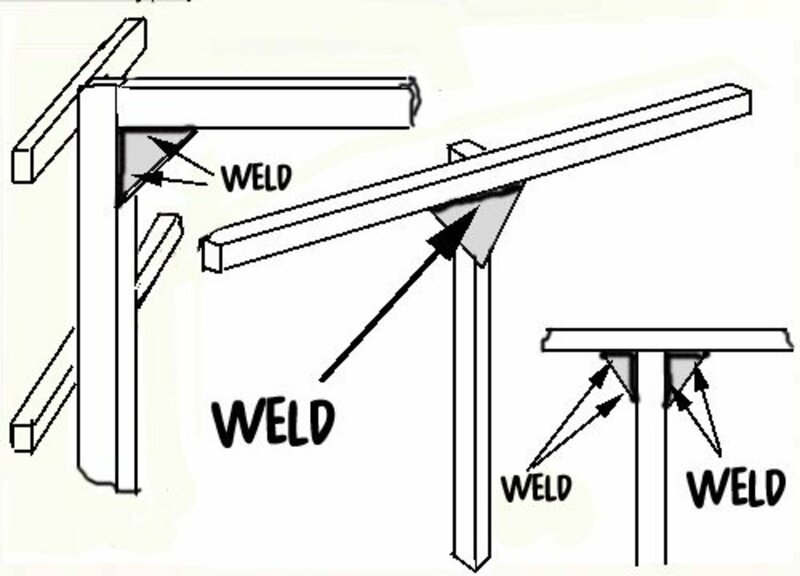 Cut two right angle triangles and weld them under the ridge support cross member and to the upright as shown in the diagram. This will give lateral support to the frame so it doesn't wobble front to back. Build a wooden equipment locker about 6 inches deep and sized to fit inside the trailer frame. Bolt it low so it is below the bottom cross member. Step 8: Cut a sheet of marine grade plywood into a box with top lid, bottom and 4 sides to make an equipment locker. Measure the inside of the frame and build the box to fit inside the frame below the bottom cross-tree. Glue and screw the bottom and sides of the box together, hinge and hasp the top lid, then paint the box and bolt it inside the trailer frame. Weld or bolt eye bolts to the ends of the cross members and to the center upright where each cross member crosses. Step 9: Drill and bolt or weld eye bolts to the outside of the cross members to provide attachment points for bungees or ratchet tie-downs. Add a row of eye bolts where the cross-trees and uprights cross. This lets you tie one end to the center eye bolt, throw the tie-down over the hull of the boat, and cinch it down to the outside eye bolt. This makes for a very secure boat. Wrap the cross members with a split Styrofoam Swim Noodle and zip tie them in place to pad the cross bars and protect the canoe or kayak. Step 10: Finally, split some Styrofoam Swim Noodles lengthwise, or cut strips of carpet, and wrap the cross-trees with this material. Secure the padding with zip ties to hold it in place. 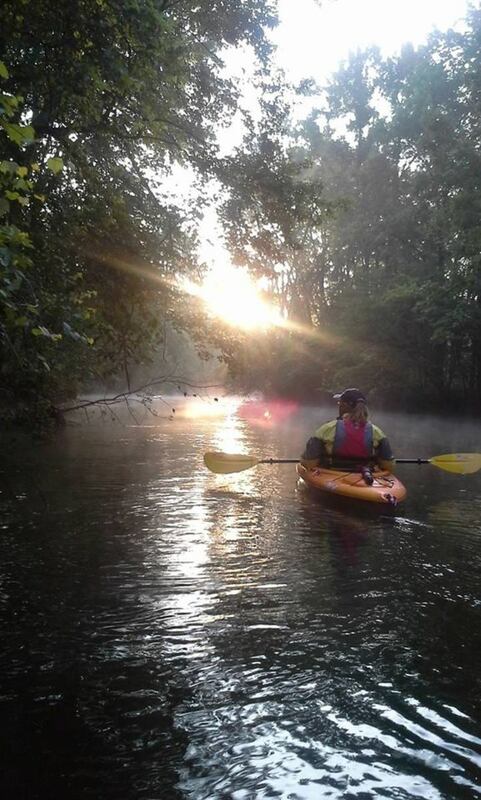 The padding will protect the hull and gunwales of your canoe or kayak from damage. 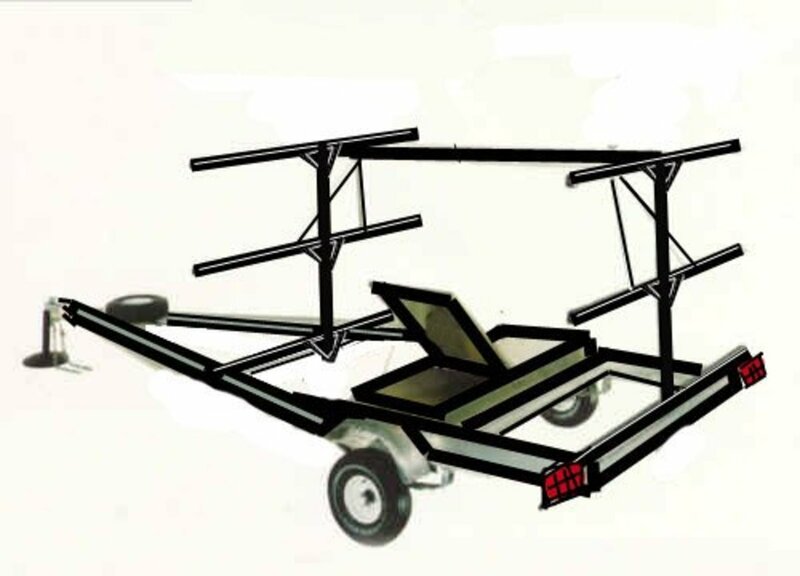 Stiffening the Framework: If the framework feels loose, you can add a couple of struts to each frame by welding metal straps from a couple of inches out on the center cross-tree to either side of the center upright to the bottom of the ridge support cross member as shown in the diagram. Don't attach the strap too far out on the cross-tree or you'll crowd the canoe. Weld the triangular gusset plates between the cross members and uprights and between the uprights and ridge support as shown in the diagram. What are the lengths of the cross members on a kayak? 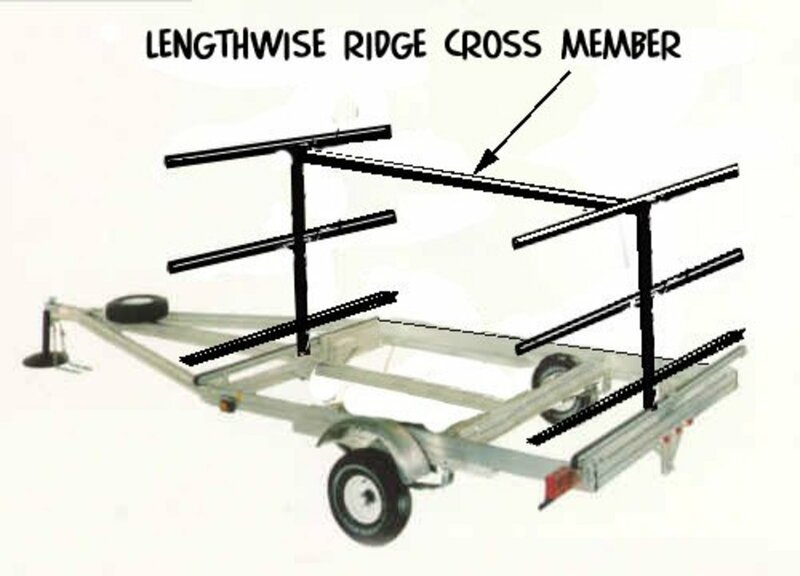 The lengths depend on two things: (1) the width of your canoe and whether you want to be able to carry two or not (you can extend the cross members to accommodate whatever you want to load on top, within reason); (2) the width of the pickup bed will determine how far apart the uprights can go. Then you have to measure that distance and cut the cross members to fit. Can you provide a sketch with dimensions to go with your instructions? The trouble is that you have to custom fit the frame to the pickup bed. Every pickup is a little different. If you have wheel wells that extend into the bed, you have to raise the lower side boards to clear them. All I can tell you is take the drawing in the article and take your tape measure and measure your pickup bed to determine the dimensions of the frame. What diameter was your tubing? I didn't include that because it depends on the width of the base frame. Just go by the attachment points. What you want to do is try to get the cross members somewhere around 1/4 to 1/3 of the length of the canoe from the ends. What was your distance between the uprights? Tnt - The cross members should be wide enough to accommodate two canoes at the center plus about six inches. if your widest canoes are, say, two feet wide, make the cross members 4 feet 6 inches. What is the length of the cross members? Andy, you are welcome to link to this website. 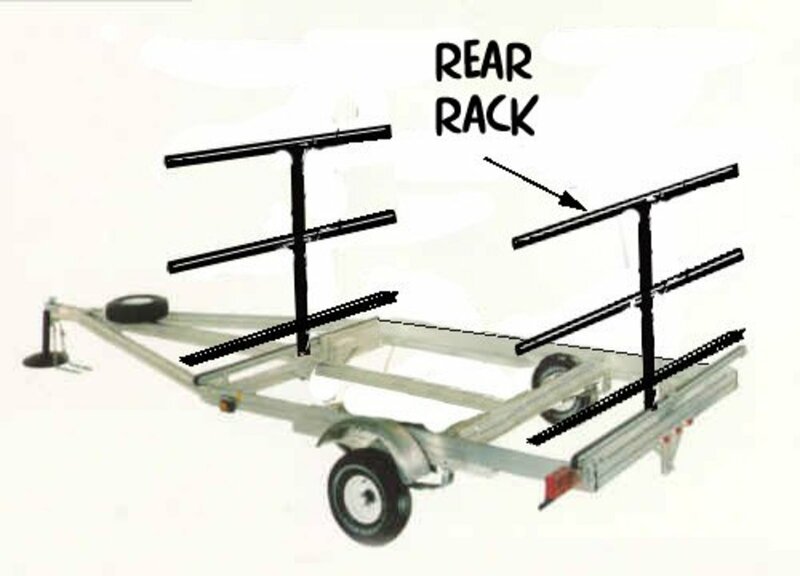 Hi Twayneking great article, I have been putting together a resource section about kayak trailers and how to put them together. I have a few pages together so far. I was wondering if you mind me using yours. You can see a link to your page here www.kayaktrailersale.com. Let me know if its okay linking to you page. By the way great work on the design! Many thanks for that. 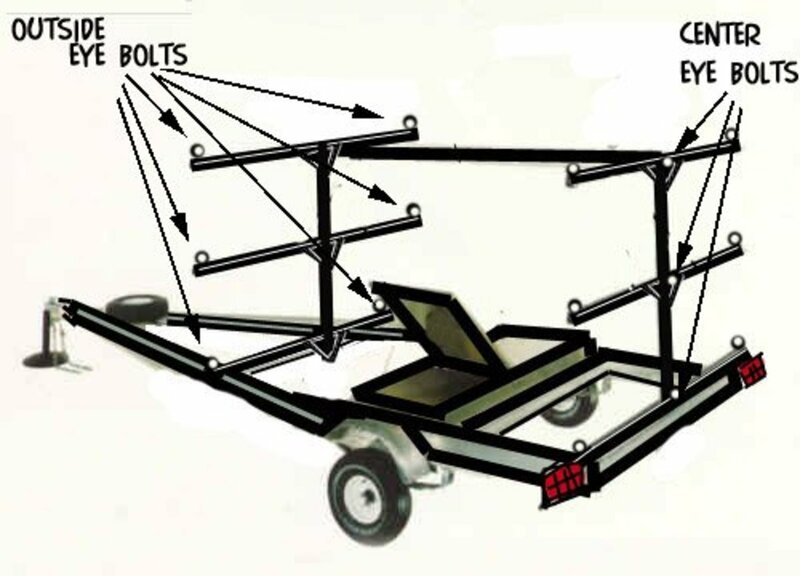 I have just bought a caravan chassis to convert, and this is the guide for it. Thanks again. I learned the hard way not to put the equipment locker on edge. We thought it would be an efficient use of space, but it really added to the lateral wind resistance. The vertical flat surface along with the already aerodynamic canoes made the trailer hop around pretty badly on narrow roads where there was a lot of wind blowing. The timing was great - spring is coming! The equipment locker is a nice extra touch and the instructions look pretty thorough. Great winter project. i'm picking up kayaks now for summer camp next summer and will need a trailer to transport. 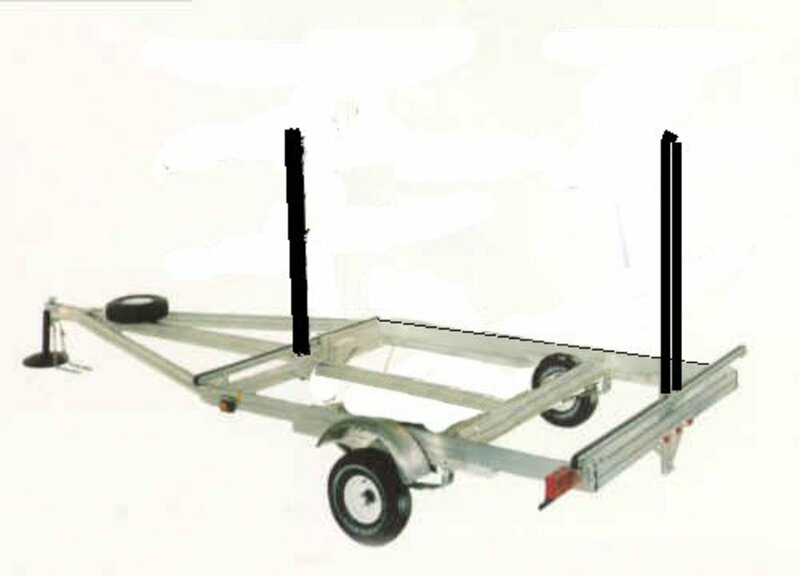 I have a boat trailer and and ready to get started. This is very helpful. Thanks. Your welcome. We built this one at summer camp. One of the guys knew a little welding and we just put all the pieces together on an old boat trailer. The trailer lasted for years at a very busy summer camp. Wow! 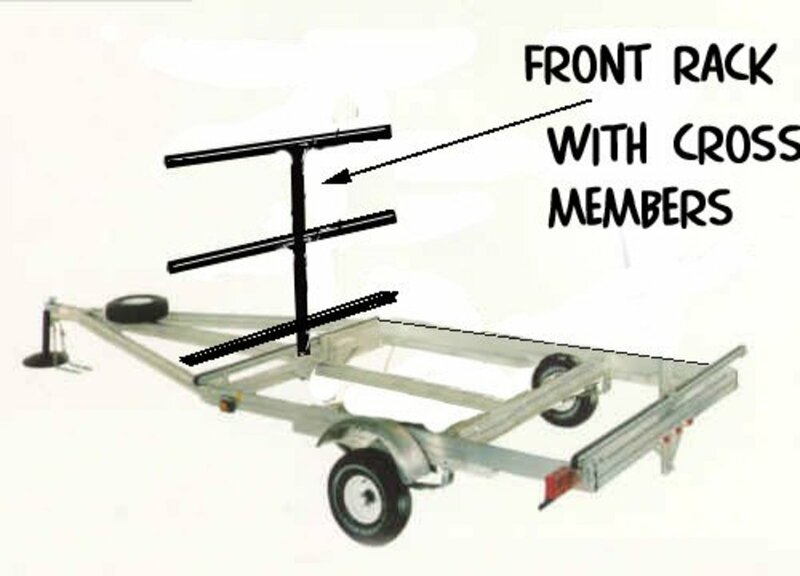 Now I think I can build a Canoe/Kayak Trailer!